If you are having any trouble or would like a more personalized order, please send me an email to ayasbodychocolate@gmail.com and I will invoice you through PayPal instead. Aya’s Body Chocolate ™️ is an exclusive, luxurious skin and hair creme and massage bar with certified organic CACAO (THEOBROMA) and essential oils, or honey from THE RAINFORESTS OF COSTA RICA. and PURA VIDA( no specific scent but it smells like chocolate). WHOLESALE PRICE: $ 30 per unit. HONEY is DETOXIFYING, NUTRITIVE, DRY LIPS, HAIR AND SKIN, AFTER SUN AND OTHER like chemichal BURNS. YLANG- YLANG is ANTI-INFLAMMATORY, ANTISEPTIC, CALMING, TREATS ANXIETY, FEAR, STRESS, INSOMNIA, BALANCING AND STIMULATING EFFECT ON THE SKIN, CORRECTS SEBUM PRODUCTION, STIMULATES HAIR GROWTH, APHRODISIAC. LEMONBALM is USED FOR ARTHRITIS, ANTI INFLAMMATORY, ACNE AND ECZEMA, COLD SORES, ANTI -BACTERIAL, ANTI-FUNGAL, ANTI-DEPRESSANT, SEDATIVE, TONIC FOR THE NERVOUS SYSTEM, INSECT REPELLANT, SOFTENS SKIN. SPICE is antimicrobial, antifungal, antiseptic, antiviral, aphrodisiac and stimulating properties, immune system booster stress relief, pain relief, insect repellant. PURA VIDA is for highly allergic people, pregnant and nursing women that should be careful with essencial oils and honey (when nursing). THE CERTIFIED ORGANIC COCOA BUTTER IS FROM THE INDIGENOUS BRI BRI WOMEN IN THE AREA OF TALAMANCA. ABC cream is ,made freshly, weekly and hydrates and balances the skin, imparts sheen, leaves skin radiant and glowing, slows down moistureloss, premature aging and agespots. It also protects, cools down and conditions skin damaged by sun and wind. Has a light amount of SPF ( coconut oil). made the LOGO OF THE FLOWER and is working actively within the company on distribution, advertizing issues, research and development. The ABC Bar is made with certfied organic and wild harvested local ingredients. LET IT MELT INTO YOUR SKIN…cocoa butter melts at bodytemperature! Small production. Made to order. 13 g sample/ hotel pillow version with your logo( $ 7 ) Special orders only. Aya Thorgren will slowly be integrating her own crops into this skincare line of the highest of quality and vibrations. Shipping will be added upon the price. $13,99 to the USA. I can send it quicker at a higher cost. 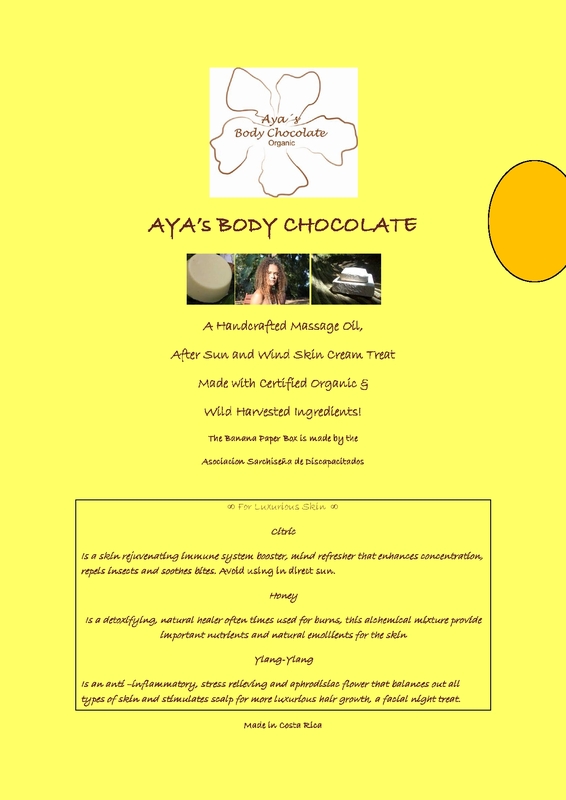 We tried Ayas Body Chocolate (Honey/ Miel) on a breast cancer patient and it healed up her chemotherapy burns in only 3 applications. Hillary Harrison, Champion Mountainbiker, Owner of Peaks n Swells SurfCamp in Montezuma Costa Rica & Skiresort Snorting Elk, Seattle,WA, USA is a big client. Elijah Hawk, Surfer, Licensed Surfinstructor & Lifeguard at Corteza Surfshop Team uses it all year. as I use heat by smooth friction. I can compare this fine coco based cream to a tropical essence of electricity … love at first touch. It, s some of the best stuff I have ever used! It has the perfect grip for my massage where I don,t slip and of course the clients just LOVE the smell of chocolate! Dianne & Barbara, both excellent Massage therapist’s can be found at Anamaya Yoga Spa Resort where my cream is used for the in- house tropical massage!